Mr Loadlink slung a kit bag over his shoulder ahead of another busy month on the road. Here I am at Topgolf Houston making a hole in one, said with tongue firmly in cheek. Fifteen years ago, two brothers were at a driving range practicing their golf swings. They started brainstorming and arrived at a concept for Topgolf, a golfing experience that balances competition with entertainment. Players hit high-tech, microchipped golf balls at targets on an outfield. The founding Jolliffe brothers describe it as a larger-than-life-sized outdoor dartboard—but for golf. It’s a good description. 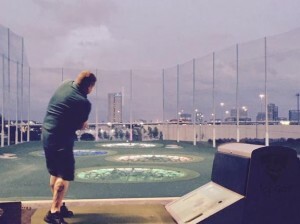 During a trip to Houston for the Offshore Technology Conference (OTC) at the start of the month (May), John Molidor, the general manager of our North American subsidiary; Aaron Orsak, technical sales engineer; and I took an opportunity to visit a Topgolf venue and enjoy some downtime. I spoke last month about the importance of “quiet hours” and changing the scenery is hugely important during hectic business trips where breakfast meetings lead into site visits, exhibitions, meetings and networking dinners. As I said in the press release we recently circulated to trade media, OTC was the first event Aaron has attended as a Straightpoint employee. While it was hugely satisfying to see him working the aisles and networking at the trade show, it was also uplifting to spend some time away from the event and relax while exchanging notes and ideas. Look what came of the Jolliffe brothers taking some time out. Topgolf has evolved to become a best-in-class entertainment facility, complete with dynamic event spaces and a very impressive food and drink menu. We have a culture at Straightpoint where everyone is asked to work incredibly hard to hit our targets but we do so in a way that is enjoyable and rewarding. The stronger the relationships between John, Aaron and myself, the more efficiently we will be able to achieve our aggressive growth strategy for the North American market. John is very familiar with the mechanics of our operation and it’s been great to see Aaron embrace the Straightpoint ethos as well. As readers will know, Aaron is formerly of Bishop Lifting Products Inc. and Certex USA so he is familiar with working at highly respected, growing companies. Utilising his skills, contacts and reputation, it will be exciting to see him grow into his new role with us. The potential growth offered by the oil and gas sector in the Gulf Coast region is enhanced by his addition to the team and OTC proved that we have acquired the right man to work with John to achieve our goals. Sport can be very symbolic of the professional world. The enjoyment of holing a ball, scoring a point or swinging a club can be very satisfying, yet you can’t take liberties and you typically get out what you put in. The slightest lack of concentration can lead to a golf ball veer off course just as a sales pitch might have done when we were on Bishop Lifting Products’ booth at OTC if we took our eyes off the ball. Golf is a very individual sport where, apart from input from a caddie (and that sort of guidance is reserved only for those at a certain level of the game), one addresses the ball and is reliant on their own skill, judgement—and maybe a bit of luck. Sometimes, business is like that. More commonly, however, it’s about camaraderie and teamwork, like a lot of other sports. 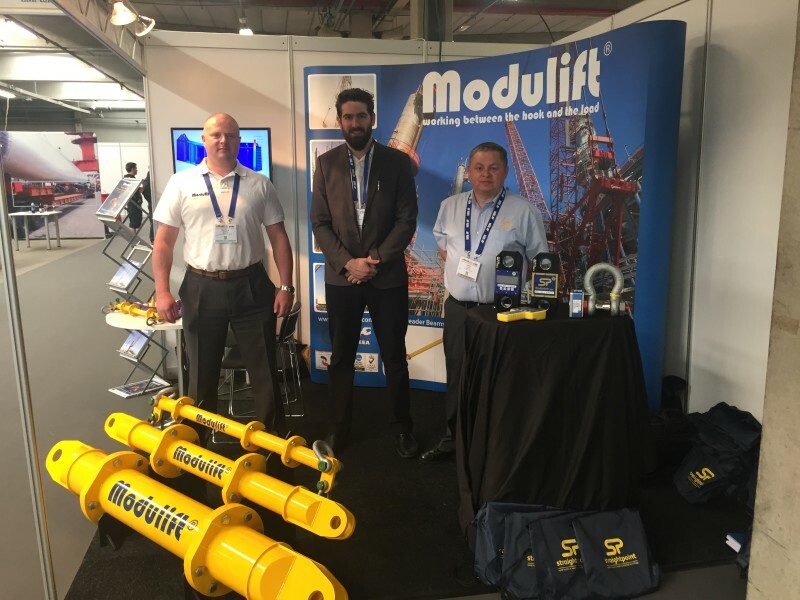 We exhibited at Breakbulk Europe alongside our peers at Modulift. Here I am with Modulift’s Malcolm Peacock, international business development manager and Anthony Culshaw, senior design engineer. From 18-21 May, Straightpoint participated in Breakbulk Europe at the Antwerp Expo in Belgium, the largest exhibition and educational forum in the world addressing the needs of traditional break bulk and cargo logistics professionals. We exhibited alongside our peers at Modulift, the premier supplier of Spreader Beams, Lifting Beams and other below the hook Lifting Equipment, where we have a strong relationship with Sarah Spivey, managing director, and her team. This particular joint venture epitomised the spirit of collaboration. The two companies share many global distributors so it made sense to work together to increase each other’s exposure and raise our profiles among cargo handling and heavy lift visitors beyond what we could achieve independently. We don’t compete with each other and often we’re trying to penetrate the same buying decision makers in the same market sectors. Furthermore, we can bounce an introduction to our products onto something in Modulift’s product mix and vice versa. Oftentimes at Breakbulk, we were talking about our load cells and the attendee showed subsequent interest in spreader beams, for example. Likewise, Sarah directed an enquiry to us when a load cell solution presented itself during a conversation about a cargo application. We’re both UK-based manufacturers of premium, market-leading technologies and I find the relationship between the two businesses personally and professionally satisfying. I keep in regular contact with Sarah and we frequently meet up at shows where, as I said, often our agendas are very similar. I came back from Antwerp with 40 strong contacts, which is probably even more than if we had tried to penetrate the marketplace alone. Enquiries came from all over the world—South America, North America, the Middle East, Russia and Asia. Sports and business coaches alike will tell you the importance of celebrating success and I thought of that during a dinner with our Belgium partner one evening in Antwerp. Philippe Toussaint, general manager, Metil Industrie is a long-standing Straightpoint distributor and it is always a pleasure to catch up with him, especially on his own turf. 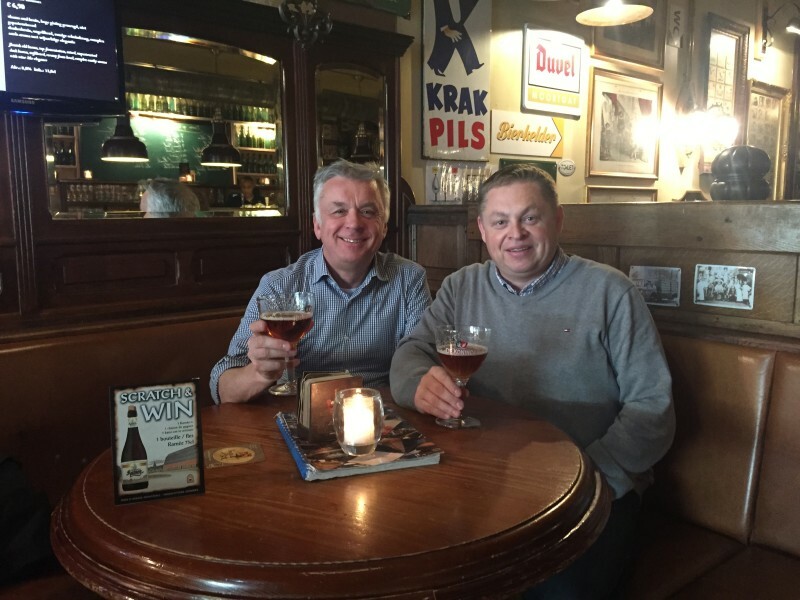 Philippe Toussaint, general manager, Metil Industrie and I enjoy some light refreshment in Antwerp. Philippe and I had a very relaxed evening but it was good to raise a glass to each other’s businesses, the strength of our partnership, a very productive day at another trade show—and to teamwork. Just like a hole in one or a tournament victory, it’s important to enjoy success with those who make it possible and remind yourself why it’s so important to keep putting in the hard work to achieve future goals, no matter how distant some of them may appear at a given point in time. 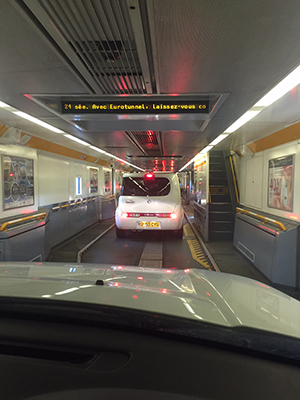 Eurotunnel connects England with mainland Europe, which is home to some of the world’s most beautiful cities. 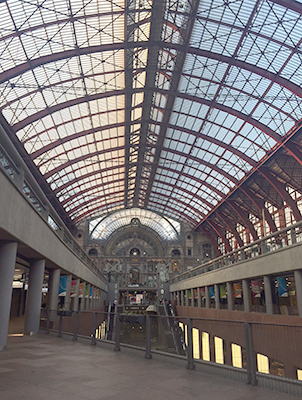 Antwerpen-Centraal (Antwerp Central) station is spectacular in itself.